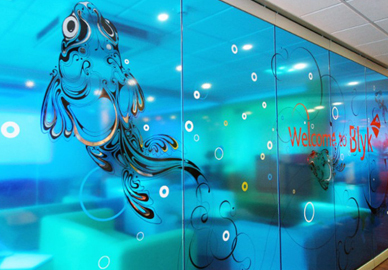 Glass manifestations are great to liven up an office or studio environment, for both staff and clients. As well as for livery, workplace laws stipulate safety stickers must be applied to any glass door and wall. But there are no restrictions on the type of stickers you can use, right? They don’t need to be the standard (some would say, boring) lines or dots, why not take the opportunity to create a strong brand impression with graphics while covering the Health & Safety aspect as well? 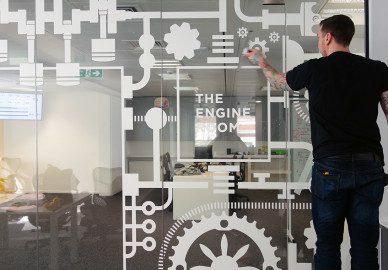 In addition to the more standard etched or ‘frosted’ vinyl, self-adhesive vinyl and cut-vinyl decals, if you're feeling creative or adventurous, we can also provide advice or suggestions on how you can make the most of your glass to really enhance the environment around you. 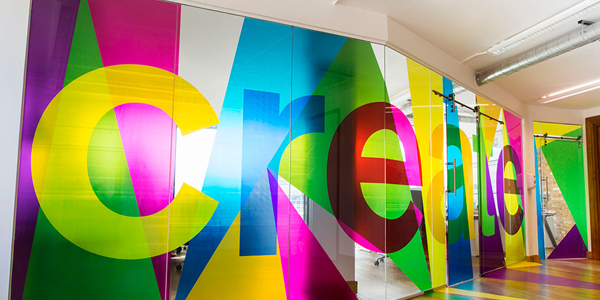 We can create graphics like the ones here to really grab the attention of everyone entering the office. 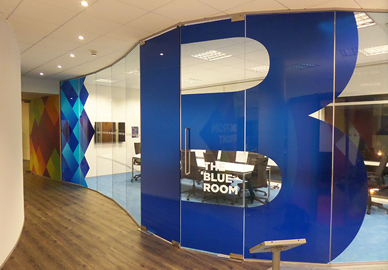 A great example is our case study for The Communication Store who were looking to create an exciting environment that ticked all the boxes as well as adding an element of privacy to some of the glass rooms. 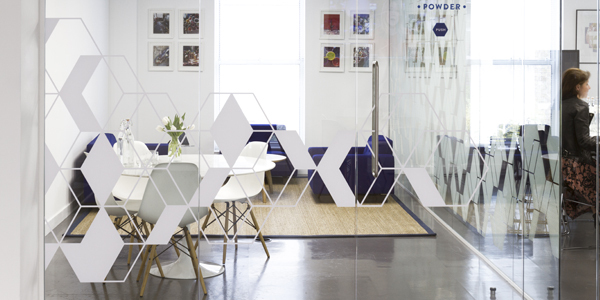 Get in touch with us today to discuss your glass manifestation requirements and gain the benefits of a well-designed and carefully branded workspace, with the advantage of meeting all safety requirements to keep your staff and visitors safe.